In the Wadi Haymiliyah of the Oman ophiolite (Haylayn block), discordant wehrlite bodies ranging in size from tens to hundreds of meters intrude the lower crust at different levels. We combined investigations on natural wehrlites from the Wadi In the Wadi Haymiliyah of the Oman ophiolite (Haylayn block), discordant wehrlite bodies ranging in size from tens to hundreds of meters intrude the lower crust at different levels. 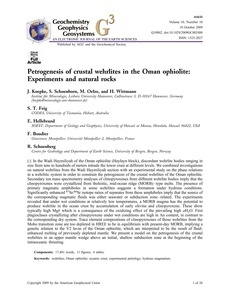 We combined investigations on natural wehrlites from the Wadi Haymiliyah section with an experimental study on the phase relations in a wehrlitic system in order to constrain the petrogenesis of the crustal wehrlites of the Oman ophiolite. Secondary ion mass spectrometry analyses of clinopyroxenes from different wehrlite bodies imply that the clinopyroxenes were crystallized from tholeiitic, mid-ocean ridge (MORB)-type melts. The presence of primary magmatic amphiboles in some wehrlites suggests a formation under hydrous conditions. Significantly enhanced Sr-87/Sr-86 isotope ratios of separates from these amphiboles imply that the source of the corresponding magmatic fluids was either seawater or subduction zone-related. The experiments revealed that under wet conditions at relatively low temperatures, a MORB magma has the potential to produce wehrlite in the ocean crust by accumulation of early olivine and clinopyroxene. These show typically high Mg# which is a consequence of the oxidizing effect of the prevailing high aH(2)O. First plagioclases crystallizing after clinopyroxene under wet conditions are high in An content, in contrast to the corresponding dry system. Trace element compositions of clinopyroxenes of those wehrlites from the Moho transition zone are too depleted in HREE to be in equilibrium with present-day MORB, implying a genetic relation to the V2 lavas of the Oman ophiolite, which are interpreted to be the result of fluid-enhanced melting of previously depleted mantle. We present a model on the petrogenesis of the crustal wehrlites in an upper mantle wedge above an initial, shallow subduction zone at the beginning of the intraoceanic thrusting.